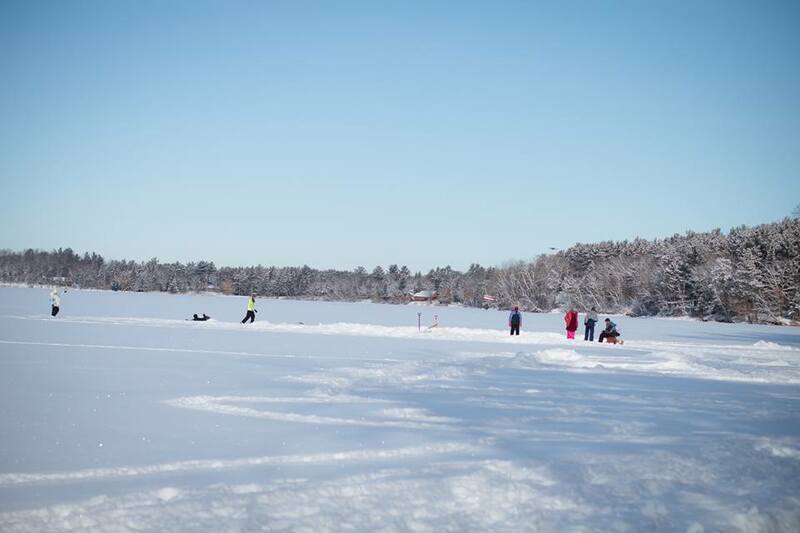 This page has information gathered by Lou Schultz and Sharon Natzel who are collaborating, with help from several observers around the lake, on the dates that the lake freezes over and the dates when it thaws in the spring. Overall, the system looks “stable” with the average “Ice In” expected to be mid-December. 2011 looks like an anomaly, but there does not appear to be a sustained trend. The charts indicate that the Ice In process is “stable” and it would appear to be normally distributed. The average Ice In is December 14 with variation from about November 20 – January 14. 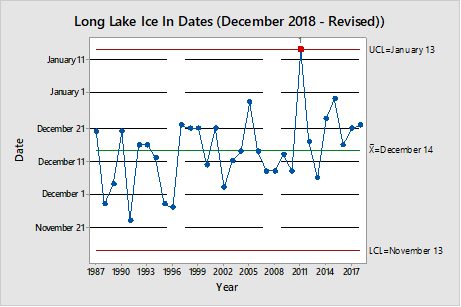 The “control Limits in the first chart indicate that 99.73 % of the time, you can expect the Ice to come in between November 12 and January 14 with the expectation that in a high percentage of the time (about 68%), the ice will come in between December 3 and December 25. Official Ice In date for 2018 was December 22. 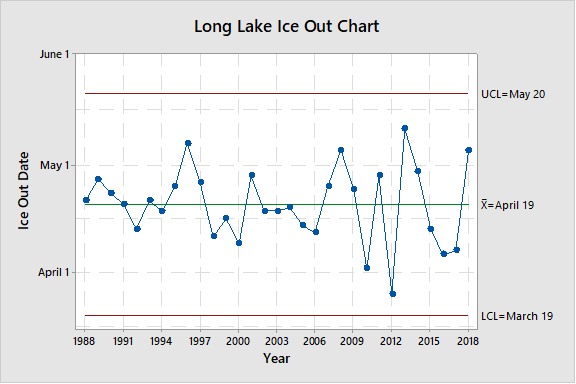 Click here to see chart of dates used to make these Ice-Out graphs. 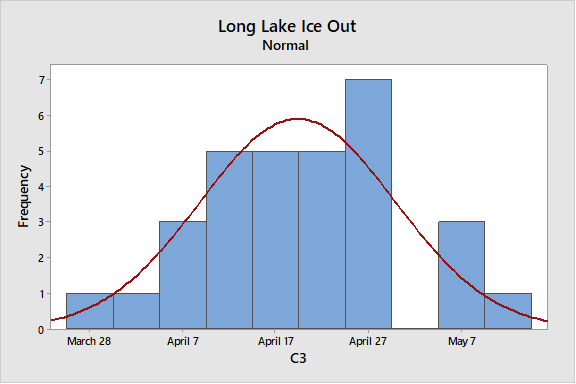 According to Vern: The Control Chart for Ice Out and a histogram are shown above. From the charts… the Ice Out chart remains “stable” although it does appear that the year to year variation has increased over the past 10-12 years. 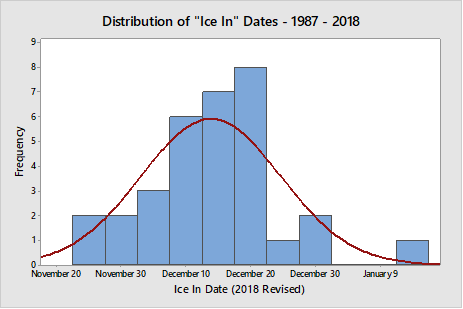 From the data it appears that Ice Out tends to follow a normal distribution, with most dates for Ice Out (approximately 99.73%) expected to be between March 19 and May 20 and with the average centered around April 19. Long Lake has some very deep spots that make exact dates for the lake freezing over difficult to calculate. The dates for ice-out in the spring are much easier. The original Ice-In and Ice-Out data was provided by the late Bella and John Sanders, whose home was near the mid-section of Long Lake. They collaborated with Bill Anderson who lives close to the deepest part of the lake toward the North end. Lou Schultz and his friend, Vern Campbell, work on the statistics for Long Lake based on these observations. Their control graphs allow us to predict our future, average (mean) ice-in date as December 12. The control limits are calculated from the data and are plus and minus three standard deviations from the mean. The green lines depict the mean or average ice-in and ice-out. The red lines show the control limits or extremes of what can be expected. They tell us in a stable system (no outside influences) we would only have three years out of one thousand where the ice-in could fall after January 3 or before November 20. It appears to be a very stable process for Long Lake. These control limits are calculated from the data and show that all the dates in the last twenty-two years are within normal variation. If we should get an ice-in date BEFORE Nov 13 and then an ice-out date AFTER March 29, we might expect something happening to our system like global warming. Less than that, we are just experiencing normal variation of our weather system.